Today we’re rolling out an updated version of Justinmind Prototyping tool! V6.7.0, among other things, features the copy/paste function from Illustrator and various improvements for text and buttons widgets. The main objective of this release is to make it possible for you to copy/paste vector images directly from Illustrator as well as to make the most of text widgets, which are now more flexible and responsive to your needs. While doing that, we also fixed some minor bugs and implemented further usability improvements. Yes, you got it right! Copy/Paste from Illustrator to Justinmind is now a reality. Up to now, if you tried to copy/paste an image from Illustrator, that only brought across a raster version instead of the vector. With Justinmind you can now copy and paste the image as a SVG file. You will be able to edit the image in Illustrator and see the changes reflected in the wireframe you’re designing. This can be done with a couple of clicks: right-click on the image, select “Open with default application”, edit the image directly in Illustrator and save the image. When you’ll go back to Justinmind, you will see the edited image. Any copy of the image will get automatically synchronized when you edit any of them. Additionally, you’ll be able to create a copy of the source image, which can be edited separately. To do this, you’ll just have to right-click on the image and select “Create Separate Copy”. The ‘Label’ and ‘Rich Text’ widgets have now been renamed to ‘Text’ and ‘Paragraph’ respectively. But it’s not only a question of names. With the new release, “Label” texts and “Buttons” gain the same properties as any rich text. Through the Properties Tab you can change font, colors, size for each portion of the text. 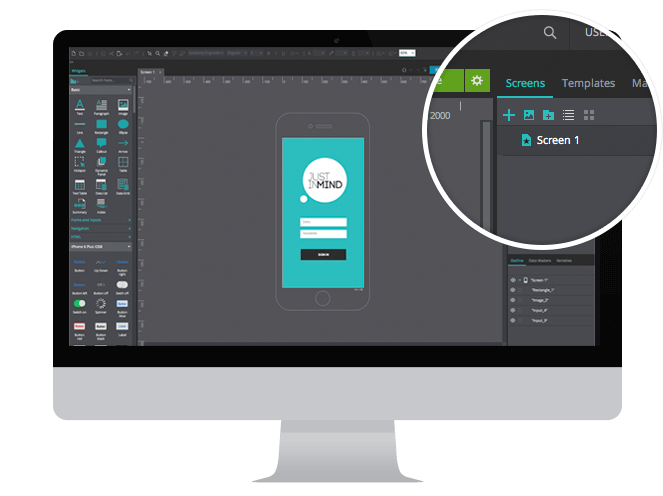 This means even less constraints to your creativity and an even more agile tool to build high-fidelity wireframes. Up to now, the option Autofit had to be selected in the Properties Tab after adding the widget, and all the times the element got redimensioned. With the new release, the Autofit has been added as a default property for the ‘Text’ and ‘Paragraph’ widgets. At the same time, you can select the option “Multiline” or “Single line” for the ‘Text’ and ‘Button’ widgets. This way, adding text to your web and app wireframes can be done in an easier and more natural way. When you create a new interactive prototype with Justinmind, you can select to start your wireframe from an image, thus having one screen for each image file added. You already have the option to add additional images directly inside the editor, but with the new release we made it even easier! You will be able to create a new screen from an image in one single step, clicking on the new icon in the screen tab. You can then add a hotspot to any section of the image, and select and drag it to its corresponding screen in the screen panel to create links. Now you can prototype even faster with Justinmind! With the previous release, we introduced a comment notification system to notify you via email when new comments were posted on your wireframes. The email notification came with a link that automatically opens the wireframe in the screen where the last comment was posted. As some of you pointed out, if a wireframe gets updated, comments from previous versions are no longer visible in the cloud. That’s why, in order to improve your experience, we listened to your feedback and made the link to each comment permanent so that you’ll always be able to access them, be them to a previous version of your wireframe or to a new one. Thanks to this update, now inserting a “Line” or “Arrow” on the screen will create an element that starts where you click on the screen and finish when you release the mouse pointer.